Maundy Thursday saw the ‘squatters’ leave (or evicted) after an evening of fury in which they tore down portions of the fence that surrounded the Chiltern block (see video below). I was able to make a visit the preceding afternoon on the same day to see the fence for myself (along with Hannah Awcock and Thomas Dekeyser), which turned out to be just in time given that now, seemingly the demolition will go ahead as planned. 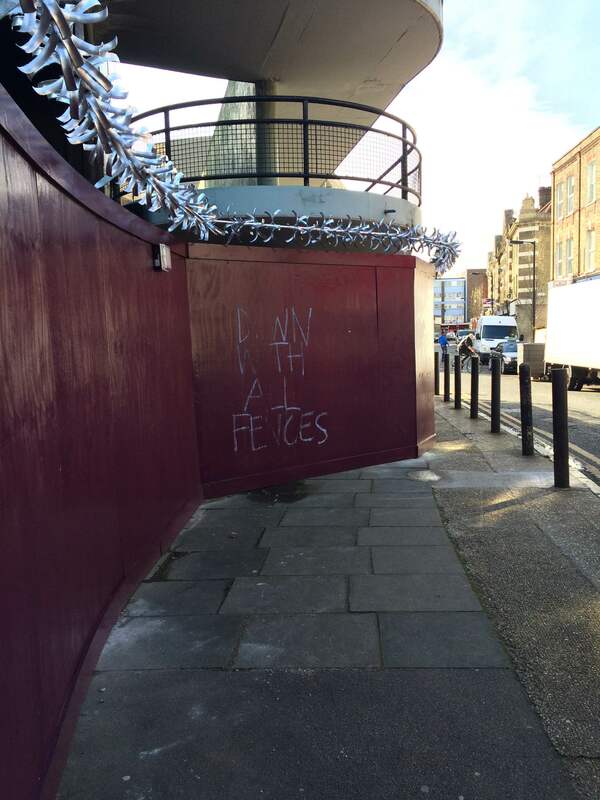 By Good Friday, the fences were being re-erected, with alarming speed and efficiency. 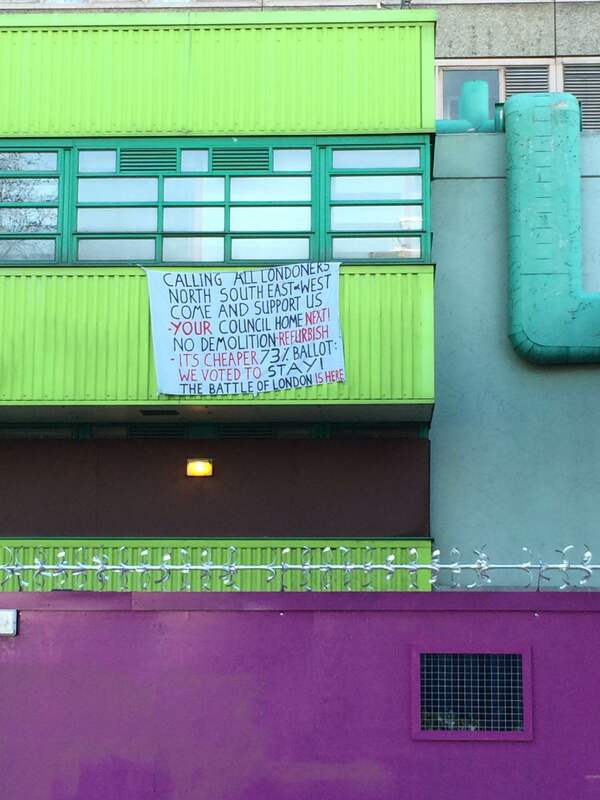 The occupation of the Aylesbury Estate has been widely documented, with the actions of Southwark Council universally condemned. Yet the alarming brutality with which those in control securitised the Estate continued. 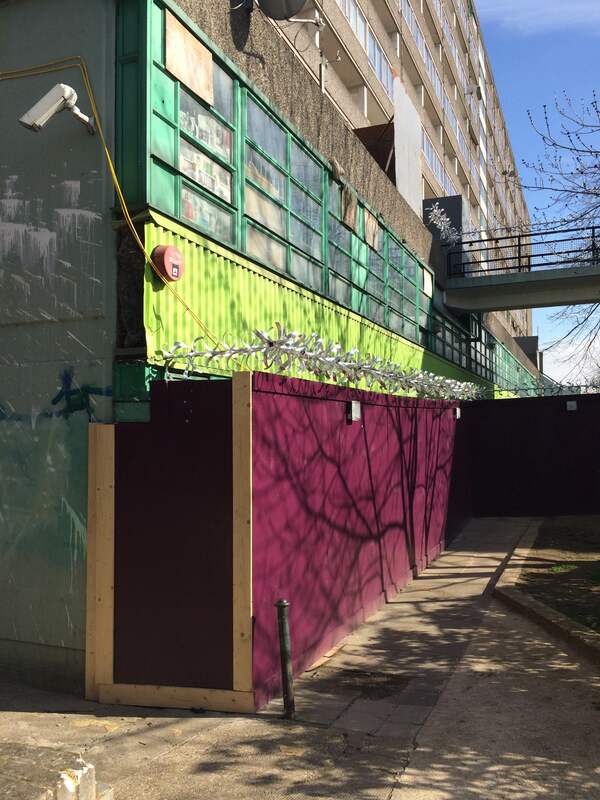 The garish purple fences (the colour of regality, pervading a brazen aristocratic-like mentality), the razor-sharp, gleamingly new hyper-defensive barbwire (although it was anything but wire, more ribbons of razors) and the privatised security force with attack dogs and menacing stares was intimidating and massively uncomfortable. We were constantly watched as we walked around, and asked “can I help you?” every time we stopped to look, or linger longer than was deemed acceptable. The aesthetic and ideological links with the Berlin Wall are overstated, but there is certainly a sense that the tactics of the elite in this situation were at least inspired by a divide-and-conquer mentality. The weaponised use of temporary ‘pop-up’ urban architecture brings home to roost many of the neoliberal eulogies of ‘tactical urbanism‘. 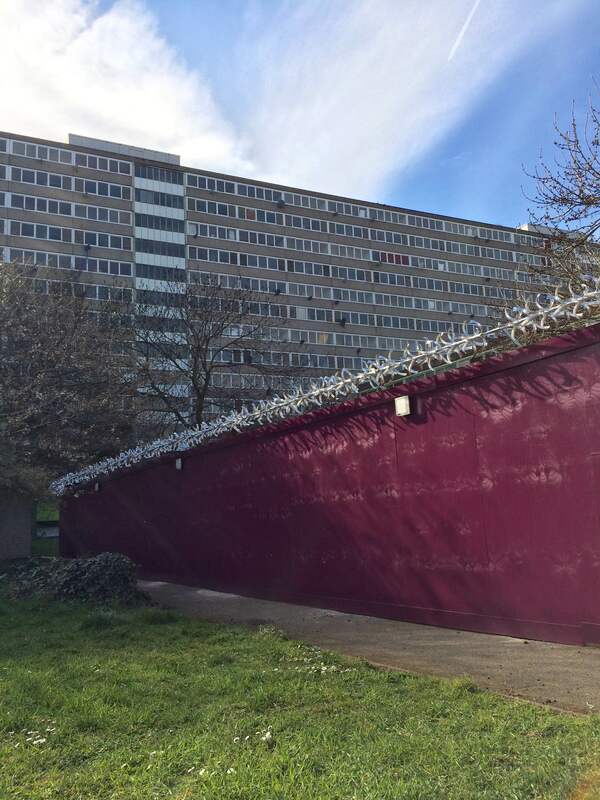 Walking around the fences, it was impossible not to feel a sense of injustice; the urban typology exuding an elitist and polarising affect that taunts the subconscious. The fact that were torn down merely 12 hours later is gratifying (as the video below shows), but it is an instance of hope in an otherwise drawn-out sense of deeper despair at the situation in London and Global Cities more broadly. 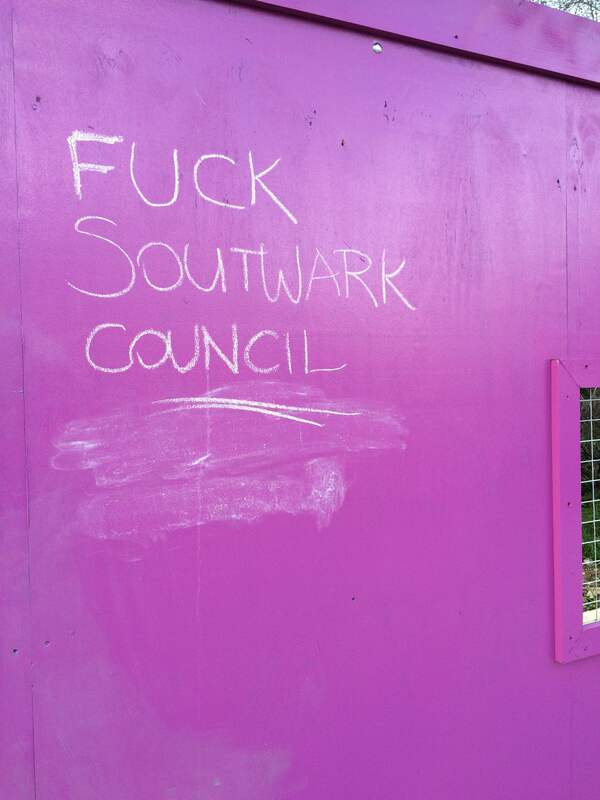 The occupiers have left apparently, attempting to spread the ideology throughout the streets of the capital. 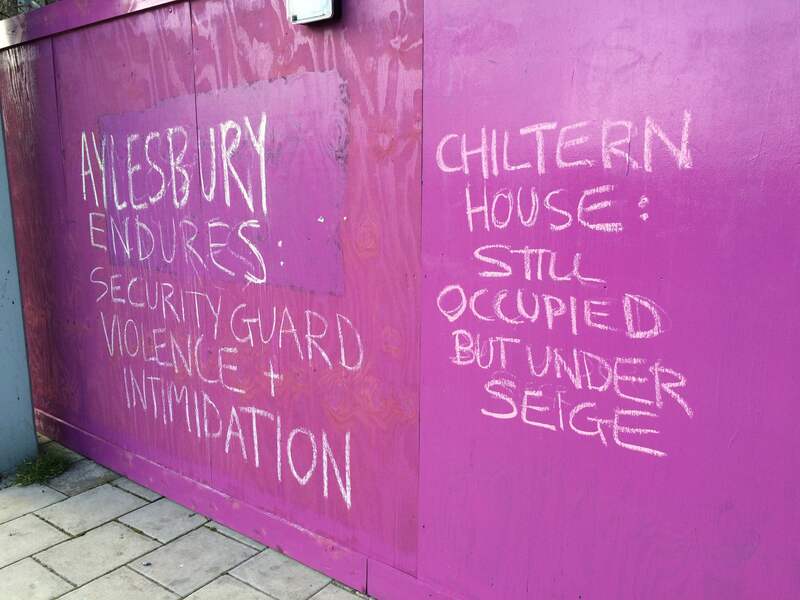 The banners and makeshift signs that fluttered form the windows of the Estate and adorned the purple blockades spoke of warnings that ‘your home could be next’, and indeed, it appears so with the Chiltern block ominously labelled ‘Phase One‘ of the wider demolition process. All over London domicide is being perpetrated by councils that are being pressurised by financial austerity, all the while doing nothing to curb or question their practices that are destroying communities and subjectivities, and making a whole lot of people very very angry indeed….